Arianespace began its busy 2017 launch schedule with a Soyuz mission tonight that marked multiple “firsts” in orbiting the Hispasat 36W-1 telecommunications satellite on a flight from the Spaceport. 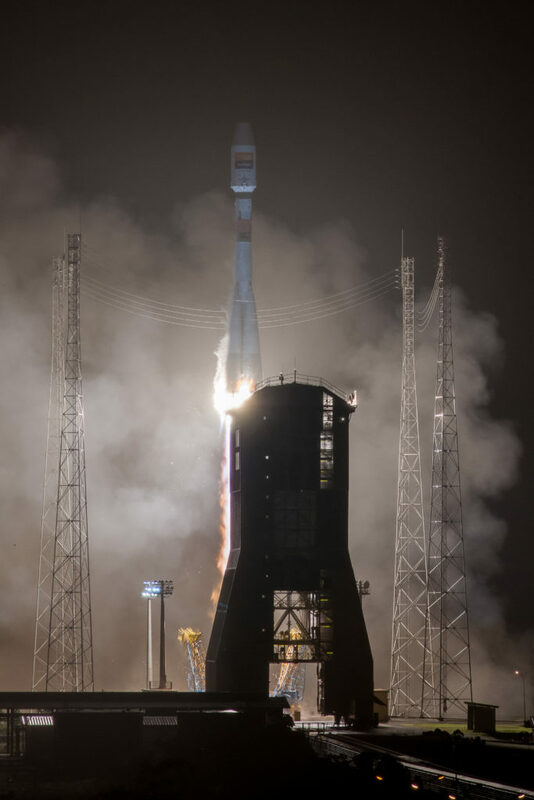 Flight VS16 was performed from the Spaceport’s ELS launch zone for Arianespace’s medium-lift Soyuz. Departing at the exact planned liftoff moment of 10:03:34 p.m. (local time in French Guiana), Soyuz flew a 32-minute profile to release its satellite passenger into geostationary transfer orbit (GTO) – the first mission that Arianespace’s medium-lift Soyuz has performed for a GTO deployment while operating from the Spaceport. Today’s success was Soyuz’ 16th launch from French Guiana since it began service at the Spaceport in 2011, and was designated Flight VS16 in Arianespace’s launcher family numbering system. The workhorse Soyuz vehicle previously delivered payloads on Spaceport missions to circular Earth orbits, low-Earth orbits, Sun-synchronous orbits, and an elliptical orbit for an Earth escape trajectory. “This flight once again demonstrates the availability and flexibility of Arianespace’s launch vehicle family at the service of our customers,” said Stéphane Israël, the company’s Chairman and CEO in comments from the Spaceport. Another first on tonight’s mission involved the Hispasat 36W-1 satellite itself, which is the initial spacecraft built using Europe’s new “SmallGEO” platform. With the ELS launch zone’s mobile gantry visible in the foreground, Flight VS16’s Soyuz begins its ascent from French Guiana with the Hispasat 36W-1 “SmallGEO” satellite. Developed by Germany’s OHB System AG under ESA’s ARTES (Advanced Research in Telecommunications Systems) program, the SmallGEO product line offers an entirely European solution in the smaller telecommunications satellite market. It benefits from faster production and testing processes, reduced costs and a broader range of design options. Once at its orbital position at 36 deg. West, Hispasat 36W-1 will enable Spanish satellite communications operator Hispasat – a leader in the distribution of content in Spanish and Portuguese – to provide a wide range of telecommunications services in Europe, the Canary Islands and South America. Equipped with 20 Ku-band transponders and the additional capacity of three transponders in Ka band, Hispasat 36W-1 features the innovative RedSAT regenerative payload, along with an antenna equipped with a processor that allows onboard beam reconfiguration. 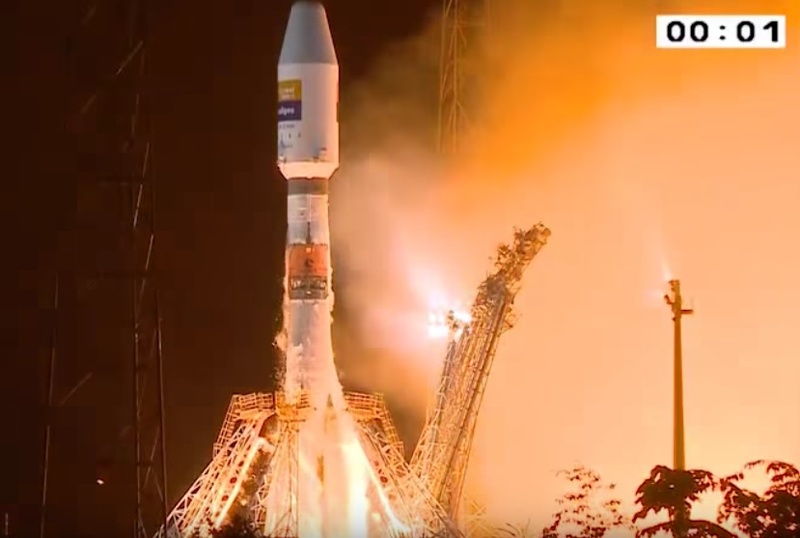 Hispasat 36W-1 had a liftoff mass of 3,210 kg., with Soyuz delivering an overall payload lift performance of 3,319 kg. on tonight’s Flight VS16 mission. Hispasat 36W-1 was the 15th OHB System-built satellite lofted by Arianespace, with 11 more in Arianespace’s order book for future launches. – Apogee altitude: 35,886.5 km. for a target of 35,862.6 km. – Perigee altitude: 249.4 km. for a target of 250.1 km..
– Inclination: 5.44 deg. for a target of 5.44 deg. As the first Arianespace mission for 2017, Flight VS16 opens a busy launch manifest that targets up to 12 flights during the year, utilizing the medium-lift Soyuz, heavy-lift Ariane 5 and lightweight Vega. Of this total, six are planned between today and late April, underscoring Arianespace’s reactivity in meeting its customers’ launch requirements. The next mission is scheduled for February 14, using an Ariane 5 to orbit two telecommunications satellite passengers. Designated Flight VA235 in Arianespace’s numbering system, this launch will carry SKY-Brasil-1 for AT&T (DIRECTV) through its affiliate DIRECTV Latin America, along with Telkom 3S for Indonesia’s Telkom.